For the past 40 years, the Korea National Open University has played a key role in broadening higher education in the nation. More than 528,000 students, mostly unable to attend a regular university or wanting additional learning in their spare time, received a degree through its distance learning program on TV and radio. The school is taking on greater roles with the sweeping changes in education spurred by technology, globalization and an aging population. An increasing portion of its students are degree holders determined to further improve their knowledge and career skills. Its lectures are accessible anytime, anywhere, through the Internet and mobile devices. 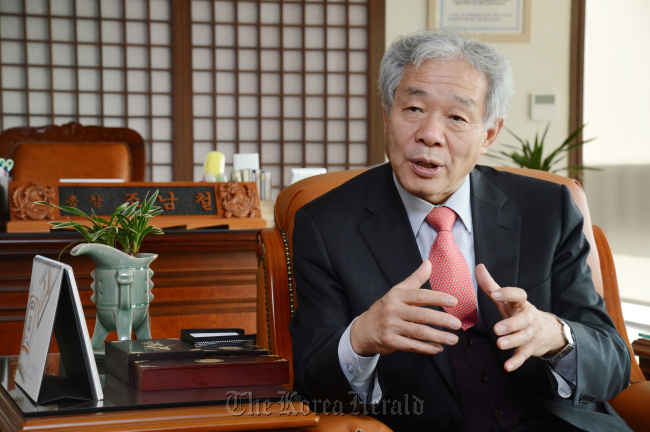 “The needs for distance learning is becoming more important with the advent of the aging society and increased life expectancy,” said Cho Nam-chul, the president of the KNOU in an interview with The Korea Herald. “An increasing number of young employees come to the institution looking to develop their careers in specific sectors, such as public administration, law and finance,” he said. The school is also expanding its global network to attract more overseas Koreans and foreign students. “The world today has become a society in which all pursue learning throughout their lifetime,” he added. Located in Daehakno, Seoul, the KNOU was founded in 1972 as Korea’s first distance learning institution. Cho, 61, joined the school as professor in 1987 and took office as president in September 2010. The key strength of the school is its system of combining classroom and online instruction, he said. The KNOU uses Web-based lectures as well as TV and audio lectures to enable students to study via a variety of multimedia to overcome time and distance barriers in learning. It also has 13 regional campuses and 32 study centers around the country, which provide face-to-face lectures and conduct offline student assessments. “In the early days, students tuned in to radio or television, and more recently they log on to their computers to access the KNOU’s lectures. Now an increasing number of students use their smartphones to hear lectures,” Cho said. Last year the KNOU developed a smartphone application called U-KNOU to create a more effective and time-saving combination of text, audio and video classes for students. According to the president, the mobile learning platform has already attracted more than 55,000 students. “Now students are very mobile and they prefer learning content on simple and portable devices,” he said. Online education is one of the fastest-changing fields in the education industry. Over the past couple of years universities across Europe and the U.S. have set up Web-based resources. Called Massive Open Online Courses, the programs provide recorded lectures, course materials and academic discussion forums to anyone free-of-charge. Top-rated institutions such as Stanford University and Harvard University have jumped onto the online education bandwagon, posing a potential challenge to existing distance-learning institutions like the KNOU. He agreed that education is strengthened by universal access to free and high-quality online courses. But MOOCs do not offer any credit or certification, he noted. “Free online learning is an inevitable trend. We also started offering some of our courses without fees,” he said. The real value of distance learning lies not in the courses they make available on the Web, but the huge number of ambitious and committed students that they can recruit, he stressed. The school began its online program in 2004 and the enrollment reached its peak in 2009 with more than 180,000 students. Low costs make distance learning popular as tuition fees of other institutions have been soaring in recent years. Taking an undergraduate course at the KNOU costs between 350,000 won and 370,000 won ($330-$350) a semester, less than one-tenth of those campus-based universities. Its annual graduates now surpass 20,000 in its four colleges ― the college of liberal arts, social sciences, natural sciences and educational sciences. It also opened the first graduate school for lifelong education among distance-learning institutions. Cho is also utilizing its global network as its key project for future development. In 2012, the KNOU started to provide an online nursing course for overseas Koreans in New York, and plans to expand it in Los Angeles. The school also signed an agreement with the Ministry of Unification to help develop education courses for North Korean defectors. It is also working on programs for multicultural families, he said. He pointed out that adult education was becoming ever more important with the lengthening of lifespan. The school is extending learning curricula for those aged 40 and older who need to develop skills for career development for after retirement. The school launched a special college for adults called Prime College, which offers those aged between 40 and 50 various learning experiences in art, farming, foreign languages and other fields. “Lifelong learning is now one of the key topics for our future society. We’ll continue to develop unique methods of study to offer students opportunities to prolong their studies and to play a leading role in making Korea a lifelong learning society,” he said.